Cats are known for being very independent pets so many cat owners are quite happy to allow them to freely roam their neighbourhood. For most owners they will find that their cat comes back every night and does this quite happily all it’s life without ever going missing or disappearing for more than a few hours. 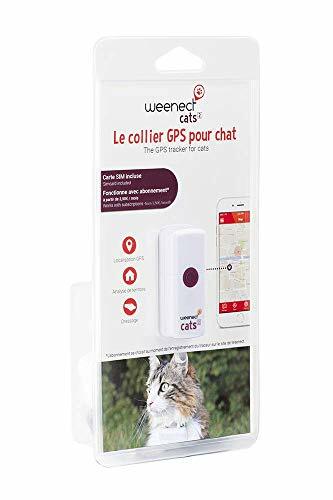 The Weenect cats 2 is one of the very best GPS trackers available which easily connects to your smartphones via their app available on Android and iPhone. It features real time location tracking and no distance limit...plus load of other incredible features! However it is unfortunately not true that cats will always come back home. If your cat doesn’t come home for a few days this can be particularly concerning for any cat owner, particularly as most domestic cats have lost their ability to successfully fend for themselves for any considerable length of time as their feral ancestors would have. Tens of thousands of cats go missing every year, in fact there are 6.5 million lost cats in Europe at any one time and it is calculated that 25% of them will never be reunited with their owners. That’s more than 1.6 million lost cats who will not be seen again by their human families! There are plenty of reasons why your cat may go missing, obviously cats are incredibly curious creatures and at times their curiosity can cause all sorts of problems which may result in them going missing for days at a time! If you have recently lost your cat and are looking for tips on how to find him or her then read our article here on how to find a lost cat. For male tom-cats which haven’t been neutered one of the most common reasons why they may disappear for several days (or even weeks sometimes) is they have caught scent of a female cat in heat. When this happens male cats will travel miles and miles to act on their animal instincts and if they find that when they get the female cat they desire is locked inside then they will simply wait until they get their chance, so it could often be as long as a week before your cat returns home to you. It is often presumed that female cats will not go looking for male cats even if they have not been spayed, however this is not true. While it is not as common for them to travel so far and wide looking for a mate, un-spayed female cats may get frustrated and will go in search of a tom-cat if given the opportunity. One easy way to prevent this from happening is to make sure you get your cats either neutered or spayed as soon as possible, this also helps prevent the growth of the feral cat population too. Getting your cat neutered or spayed doesn’t mean they wont wander off chasing a bird or mouse or some other thing of interest they may have spotted but they are unlikely to travel anywhere near the kind of distances that the desire to mate would motivate them to travel! Cats are more likely to go missing during the summer months when the weather is great and they feel inclined to spend more time outdoors chasing insects and small animals. Cats are famous for their lightning reflexes and I’m sure you will have seen how many cats when they have been suddenly startled by something will leap into the air and run as fast as they can away from whatever it was that frightened them so much. If your cat is caught unawares and frantically runs to a place it is unfamiliar with then this may cause them to go missing for sometime, particularly if they find themselves stuck behind a busy road or crossing. Most cats will eventually find their way back after an incident like this but it may take them until nightfall (when traffic and noise has died down) to summon up the courage to retrace their steps. While you can’t really prevent this kind of behaviour without keeping your cat permanently locked into your home it may be worth considering using a cat tracker so that you can keep an eye on where your cat has gone on it’s adventures. Cats are particularly sensitive to change in their home environment so they may decide to move on if they find a more favourable place which caters for their needs. For example if a new dog or baby arrives in your household your cat may start thinking that they would be better off taking up residence in the nice quiet house of the old lady who has fed them in the past. In order to prevent this happening try to ensure that your cat is well looked after at home, it has clean fresh water, great cat food, a clean litter tray and, most importantly, a safe, comfortable, quiet place where it can hide away inside your house in order to get some complete peace and quiet when your cat needs to. Invest in a good quality cat tracking device to give yourself peace of mind and allow yourself to find out exactly where your cat is it at any given time. Get your cat spayed or neutered as soon as possible. Invest in a good quality cat enclosure or catio to prevent your cat leaving your garden. Install a microchip compatible cat flap to limit your cats time outdoors. Make sure that your cat has everything it needs and wants in your home so that it need never go looking elsewhere for a more comfortable life, gadgets like a cat water fountain help improve your cats perception of their home. www.tuxedo-cat.co.uk is a participant in the Amazon Services LLC Associates Program, an affiliate advertising program designed to provide means for sites to earn advertising fees by advertising and linking to Amazon. Amazon and Amazon Logos are trademarks of Amazon.com, Inc. or it's affiliates.